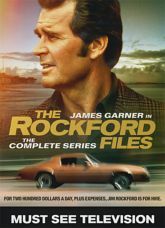 For only "two hundred dollars a day, plus expenses," the original and quintessential anti-hero detective, Jim Rockford, is on the case! James Garner stars as the ex-con-turned-private-investigator who stays under the radar and takes on the cases of the lost and the dispossessed, chasing down seemingly long-dead clues in the sunbaked streets and seamy alleys of Los Angeles. And now, all of the episodes from the series six seasons are found in this 22-disc anthology DVD set! Noah Beery, Jr. and Joe Santos co-star, and guest appearances are made by Lauren Bacall, Larry Hagman, Suzanne Somers, Ned Beatty, Linda Evans, Rob Reiner, Louis Gossett Jr., Dionne Warwick, Rick Springfield, Tom Selleck, and many more.